When Josephine Knowles left for the Klondike gold fields with her husband in 1898, she didn’t know she would be facing a constant battle with cold, disease, malnutrition and the ever-present possibility of death. 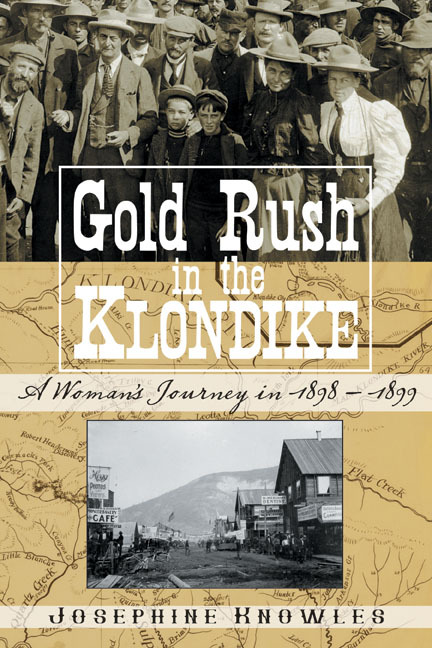 Gold Rush in the Klondike is Knowles’s true story of her year in the Yukon territory, a revealing, never-before-published personal memoir of day-to-day life at the height of the Klondike Gold Rush. Written in a clear, forthright, nineteenth-century style, Gold Rush in the Klondike presents terrifying struggles against a hostile environment, picturesque descriptions of an untouched Arctic wilderness and Knowles’s keen observations of men and women on the frontier. A Victorian gentlewoman of refinement, Knowles found herself among swearing, whoring, sometimes violent miners, whom she won over with her grit and compassion. Deciding to never moralize or condemn, Knowles writes frankly of the intense hardships that drove miners into lives of drink and dissipation and the frontier women who were forced to make stark choices between prostitution and starvation. Illustrated with period photographs, Gold Rush in the Klondike is an invaluable historical document of a lost time and place and an admirable portrait of one woman’s determination in the face of danger. Audience: History readers, women’s history readers and nineteenth-century history readers. About the Author: Josephine Knowles was born in Illinois in 1864. She lived in Nebraska and California before her extraordinary year in the Klondike in 1898–1899. She returned to San Francisco in the spring of 1899 and spent the rest of her life there. Knowles died in Berkeley, California, in 1936, at the age of 71.